I know this is sort of a weird metric, but if you take a given carmaker and look at the horsepower of every production vehicle they’ve made, you can see their spread of horsepower. 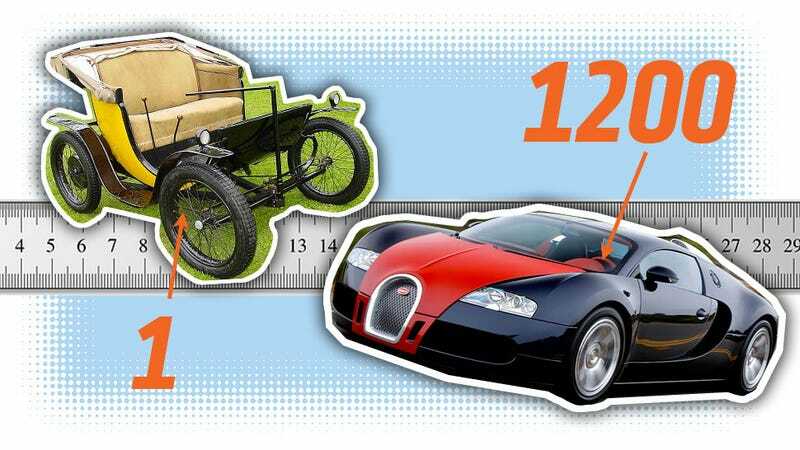 Most long-running car companies have a pretty large spread, but nobody beats Bugatti. Take Volkswagen, as an example. They’ve built and sold cars that have a power range from 25 HP (the very first 1100cc Beetle) to more than 400 in the Phaeton. That’s a good spread, but it’s nothing compared to Bugatti. Let me introduce you to the Bugatti Type 56: a one horsepower electric car. The Type 56 was first built for Ettore Bugatti as a little runabout to move around the factory, and people were so charmed by the little half-egg that he was convinced to put it into some sort of limited production. So, that means that Bugatti has built and sold cars with a range of 1 to 1200 in the Veyron—or as much as 1478 HP in the new Chiron. A swift burst of mental math, assisted by a stack of marbles and a chalkboard tells me that that’s a range of 1477 HP (I fixed the math – thanks!). Is there any company with a collective horsepower range bigger than that? I’m skeptical, but, knowing this crowd, I bet I’ll get proved wrong within about 20 minutes, when someone shows a picture of an experimental AMC Pacer with an inline six that used inverted cam lobes and an India rubber crankshaft or something to make -245 HP.